While the house of Puiforcat was founded in 1820, it was fourth generation visionary Jean Puiforcat who really established the firm in the forefront of modern design. A sculptor, artist, painter and mathematician, he was more interested in pure form and function than the fancy finery of flatware that had preceded him. 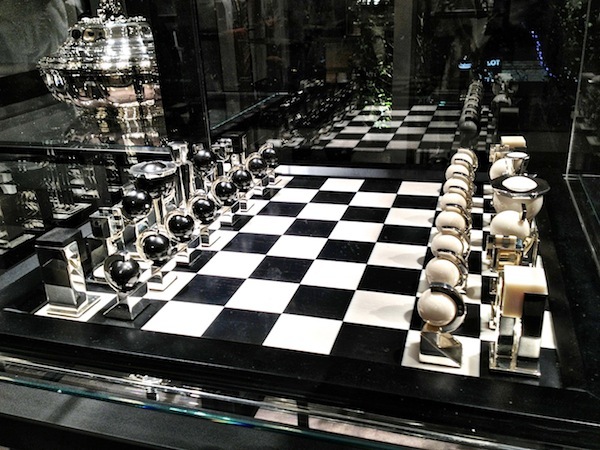 Stripping away all excess, he immersed himself in Art Deco, producing such masterpieces as this exceptional chess set. From 1927, the combination of silver, ivory and Macassar ebony was a notable feature of his work. Aside from its obvious beauty, the shape of each piece was designed with both its possible path and personality in mind – again the merging of art and mathematics. In 1993, Puiforcat became part of the Hermès family whose expert craftsmanship and dedication to heritage keeps the legacy alive. 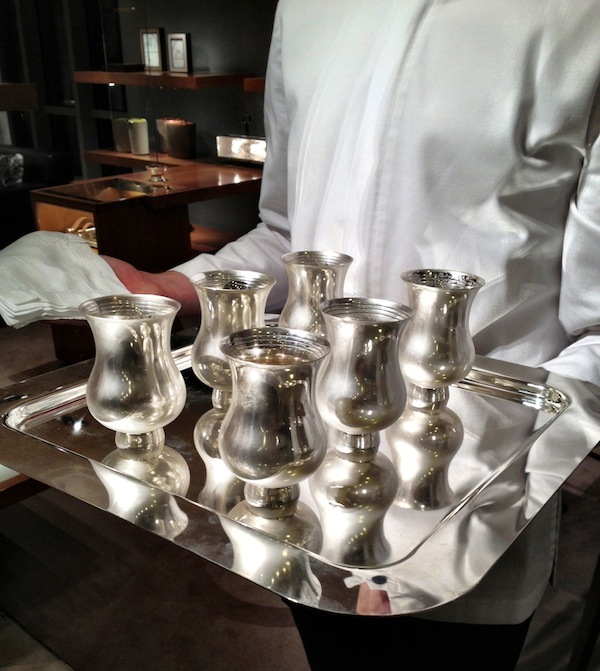 This week Hermés hosted a trunk show I attended, exhibiting a few of the exceptional silver pieces of Puiforcat. Like its parent company, Puiforcat is preserving the past while facing forward, forming both creative partnerships and new classics, such as one of my favorites, the champagne beaker. 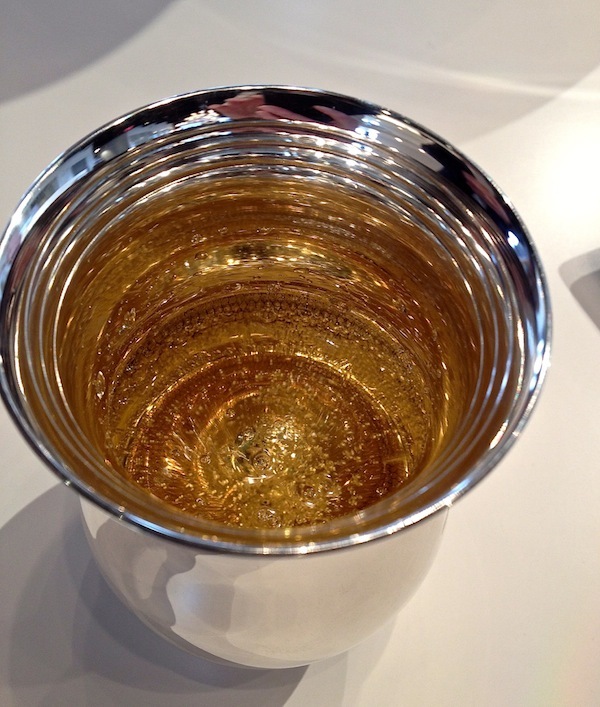 Created in 1999 in collaboration with Champagne maker Bruno Paillard, the sterling beaker was designed to heighten the sensory experience. Again form follows function – there is a deceptive simplicity to the elegant timbale. Inside, the base comes to a point and is scored, concentrating the aroma and protecting the effervescence. And when champagne is poured into the cup, it takes on a vivid golden glow, frosting the sterling exterior and insulating the chilled bubbly. The bands at the top, representing the three grape varietals, keep the bubbles from overwhelming, more like the subtlety of a vintage bottle – it’s an experience that engages all the senses! 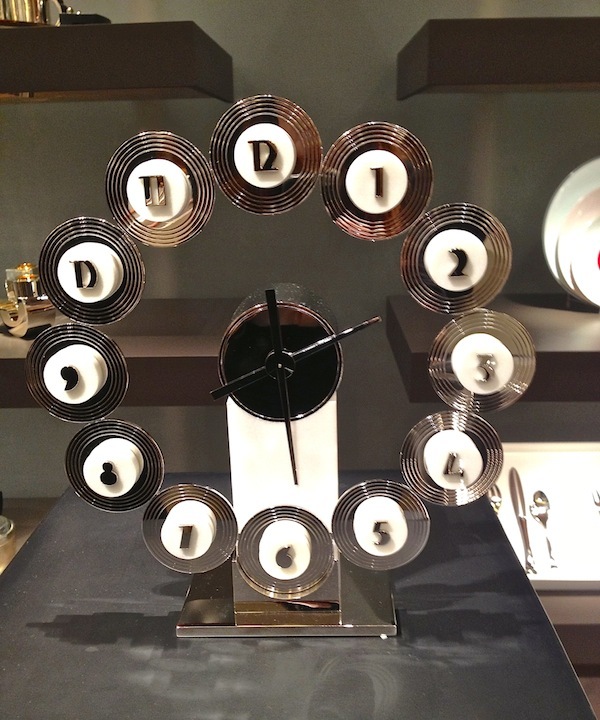 Another deco classic is this clock with a seemingly floating circle of numbers, each a white marble cylinder on nickel-plated disk. Puiforcat is reproducing a limited fun of 50 pieces, updated with a 21 day mechanical movement specially designed by a Swiss watch maker. 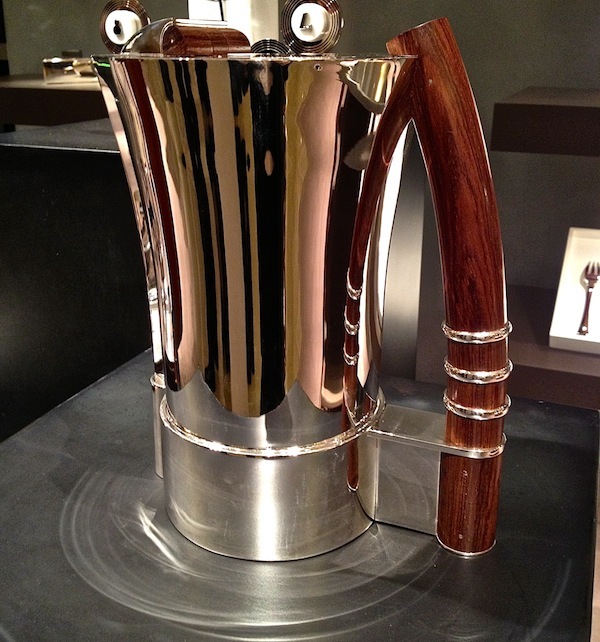 How elegant and modern is this orange juice pitcher created in 1930, combining the warmth of beautiful rosewood with the luster of sterling. The timeless design even features a hidden pivot hinge for the cover so as not to disturb the refined lines of the piece. 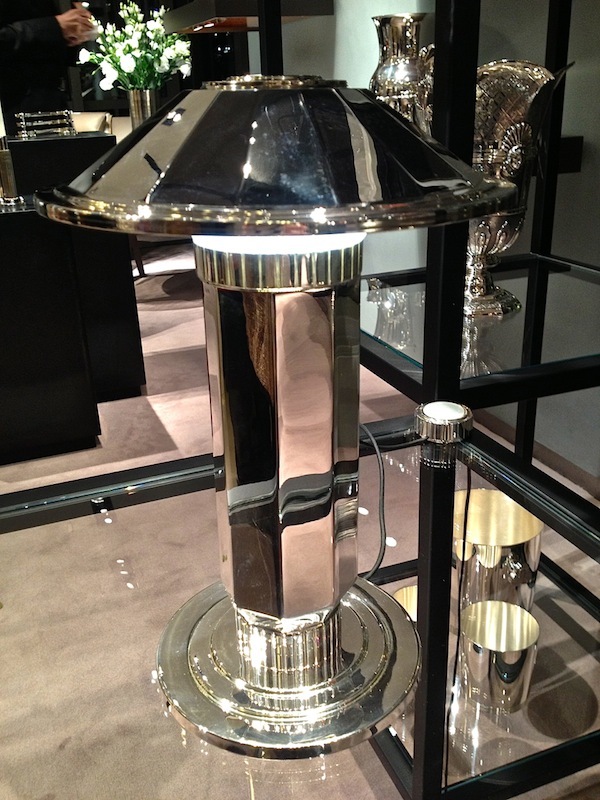 Perhaps the most iconic piece presented was this lamp. Handmade in the Puiforcat workshop of 4.4 pounds of sterling, its stylish design from 1925 is still as sophisticated and chic today as it was then. The only updating is the LED technology within, allowing brightness and light controls with a switch of the faceted sterling and onyx dimmer switch. This entry posted in design, gifts, interior design. Entry Tags: hermes, Luxury, Puiforcat, Silver Bookmark the permalink. I adore Puiforcat and exquisite silver. What a wonderful post. Were you there? Those champagne sterling timbale’s remind me of a silver Kentucky mint julep cup. What beautiful pieces and I love the second of the champagne cups, I want! Wonderful feature on a truly fabulous brand! Timeless pieces! I love the chess board, simple but so unique. 79 queries in 0.448 seconds.